As an aggregate response to the billions of terms people type into the search engine every day, Google’s autocomplete has become a weird expression of our cultural consciousness, a catalog of the English-speaking world’s most secret fears and desires. All you have to do is type a seemingly innocuous phrase into the search bar, and within seconds autocomplete has provided you with a handy list of every perverse, frightened, or just plain weird way that the people you share a globe with have thought to finish it. It’s a staggering compendium of people’s deep-seated neuroses, so obviously the best thing to do with all that information was to turn it into a game show. 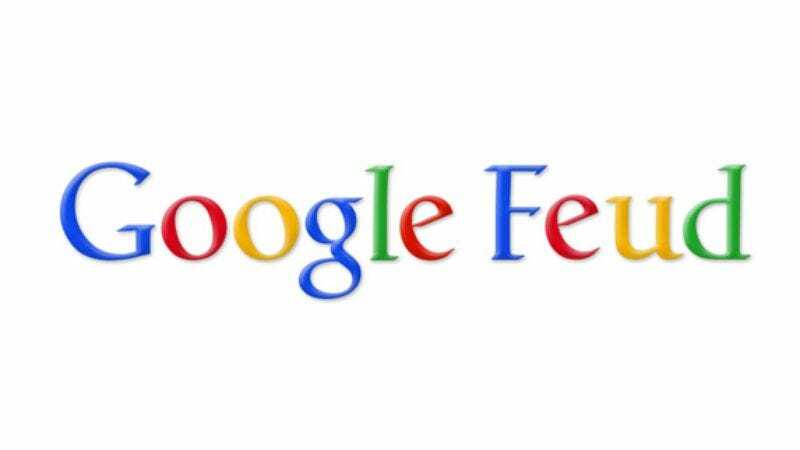 Writer Justin Hook (whose work can currently be found in Dynamite Comics’ Bob Burgers comic book) has put together Google Feud, the game that pits your beliefs about human nature against the cold logic of the machine. In a parody of the Family Feud complete with the big red X’s but sans a hooting audience or Steve Harvey’s rolling eyes, players pick a category and then try to guess the most common autocomplete responses. It’s as tricky as it is sadly revealing—“how do you make,” for instance, accepts answers ranging from “jello shots” to “money on YouTube,” while “should I stop” runs the gamut from “breastfeeding” to “smoking weed.” So go ahead, give it a play; it’ll be the most depressing fun you have all week.